In honor of Katharine Weber, True Confections, and her brilliant “Little Sammies” candies, I am dedicating this week to Tootsie Rolls. Who really likes Tootsie Rolls, any way? Not quite chocolate, not quite caramel, not quite taffy. I remember getting lots of Tootsie Rolls in my Halloween bucket, and wishing for less. Now that I buy Halloween candy to give away, I know why: it’s cheap. It’s chocolate-ish, but without the expense of actual chocolate. Actually, its this not-quite-chocolate that goes a long way toward explaining the endurance of Tootsie Roll in the candy universe. Before air conditioning and refrigeration, selling candy in the summer months was a tricky proposition. Chocolate, of course, was out. Summer candies were your taffies and your marshmallows, things that could bear some heat and humidity and not suffer too much. The genius of Tootsie Roll was to create a summer candy that was a flavor never before seen in summer candies, the flavor of chocolate. 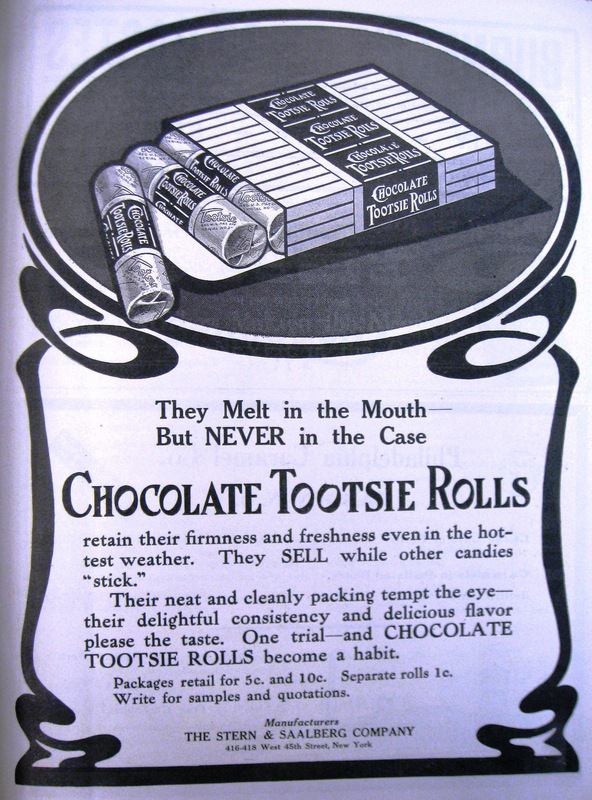 This ad to the retail trade from 1910 promises “They melt in the mouth… But NEVER in the case.” Reminds me of another slogan about melting in the mouth… But the point here is that, because they are individually wrapped, they won’t stick together. And because they are what they are, they won’t collapse in a puddle if you ship them in July. Chocolate Tootsie Rolls: About 40 per cent, glucose and 48 per cent, of sugar. Not enough chocolate to give a characteristic flavor or to warrant name. I’m with Wiley on the chocolate flavor problem. Notice they dropped the “Chocolate” in the name of the candy, so now it’s just “Tootsie Roll.” But they were still using the word “chocolate” on the wrapper in the 1940s and 1950s. If you eat one of these with your eyes closed, and you don’t know what it is, I doubt “chocolate” will come to mind. As far as I’m concerned, the chocolaty flavor of Tootsie Rolls is mostly the power of suggestion. The Tootsie Roll story began in 1896, when Austrian-born Leo Hirshfield opened a tiny candy shop in New York City. Taking full advantage of his confectioner’s background, Hirshfield hand-crafted a variety of products, including an individually wrapped, oblong, chewy, chocolate candy that quickly became a customer favorite. Sold at a penny apiece and affectionately named after Hirshfield’s five-year old daughter, Clara, whose nickname was “Tootsie,” Tootsie Rolls propelled Hirshfield’s modest corner store into burgeoning candy enterprise that has evolved in little more than a century into the multinational corporation, Tootsie Roll Industries. But wait just a second. That 1910 ad we were looking at, it doesn’t say anything about Leo Hirshfield. The company advertising “Chocolate Tootsie Rolls” is called Stern & Saalberg. So were there two companies making Tootsie Rolls in the early 1900s? Is this a Tootsie Roll impostor, a chewy chocolaty thief? Where is Leo Hirshfield? A fudgey mystery is afoot… Stay tuned! Check out my review of True Confections for more on Katharine Weber’s candy fancies. You may be aware that we have a serious infrastructure problem in this country. We’ve got collapsing bridges, rusting water mains, and exploding man holes. Worst of all if you just bought a new car, we’ve got potholes. Big ones. Here in New York City, you’ve got to watch your small pets and children, lest they tumble in never to be seen. As in all difficulties, we turn to candy when the chips are down. Here’s one idea. It’s not new, but I think it might work. It was 1909, in Newton, Massachusetts. That’s just outside Boston, so you know there’s a lot of brain power to draw on. The roads were in bad shape, and coal tar was getting expensive. The city elders put their heads together. What else could they use to pave the streets of Newton? Maybe they had some sticky taffy at that meeting, and maybe an alderman looked at the taffy, and looked at the coal tar, and a lighbulb went off. Why not use the stickyness of sugar instead of the stickyness of coal tar to hold the road together? So the took some of the waste syrup from the sugar refineries, and they mixed it up with pulverized stone, and they paved a road with it. And some deemed it a success, cheaper and better than coal tar! Of course, it’s pretty cold up there in Massachusetts for part of the year. Now when it warmed up, that’s when things might get interesting. Possibly we may eventually witness, when hot weather again comes around, the hopeless struggles of automobile parties firmly glued to this molasses highway, like unwary flies upon sheets of “catch ‘em alive” paper. This will be diverting to the outsiders. Source: “A Molasses Road,” Confectioners Journal, Jan. 1909, p. 71. U.S. soldiers in the nineteen-teens were distinguished by many virtues: their bravery, their manliness, and above all, for their craving for sweets. Rations in the Army around 1916 included bread, potatoes, bacon and beans or fresh meat, cheese, coffee, tea, butter, milk, sugar, an orange or an apple, pepper, salt, and 1/4 pound sugar per day. Given such blandly nutritious fare, it wasn’t a surprise that the boys serving in the military would be glad of some candy. In a report on military morale in 1917, Dr. Naismith, a profesor of physical education at University of Kansas, encouraged gifts of candy to accompany letters from home, in preference of “sob letters and night gowns,” typical items that Naismith called “the most worrying and useless things the boys on the border last summer received from home.” As Dr. Naismith noted, “his appetite for sweets, too, is very keen. The army ration, wholesome and nourishing, hasn’t many trimmings, so candy always is warmly welcomed by the boys.” . The call for candy did not go unanswered. In August 1917, Wallace and Co. of Brooklyn began advertising the “Service Package” to retail dealers. This box of confection was “designed and packed for the boys” and meant to be purchased on subscription: the customer would pay, and the retailer would send out the package on a regular basis. This would be an easy sale: “We know there is nothing a soldier or sailor on active duty appreciates more than candy. His chances of buying candy for himself are very small, therefore such a gift, delivered by Uncle Sam’s Postal Department, is a most welcome addition to the service rations and a cheerful remembrance from home.” And what would the happy soldier receive in his Service Package? One package each of lemon drops, wild cherry drops, and broken candy, two rations of eating chocolate, and two packages of chewing gum, all wrapped in a box covered with inspirational images of soldiers at salute, cannons, explosions, and the American eagle. Even before the U.S. joined the European war, the soldiers’ love of candy was a common theme. By 1915 there were reports that “one of the finest old American slang terms is about to succumb to the stern demands of war.” Where Americans used to say “taking candy from a baby,” now it would be more accurate to describe that tearful tug of war as “taking candy from a soldier.” One pundit went so far as to suggest a novel military strategy based on candy: “Put a chocolate statue of the Kaiser in the square at Berlin and our men will take it in a week” (attributed to Sir John French, British Army Inspector-General). We know that a country at war does not lose its desire for confectionery. The European war has taught us however that huge standing armies consume huge quantities of candy, and it is a fact that thousands upon thousands of men who seldom if ever eat candy before, begin to crave for sweetmeats after they feel the rigors of active army life. The world must have its sweets. As the wise man has said, ’Candy’s fair in love and war.’ The lover demands his package of bon-bons with which to propitiate his sweetheart; and the veteran of the tranches requests his strength-renewing tablet of chocolate. Sources: “The Chocolate Soldier,” International Confectioner October 1915, p. 36; “Preparedness,” International Confectioner June 1916, p. 39; R.F. Mackenzie speech to NCA, 10 May 1916, International Confectioner May 1916, p. 41-42. Wallace and Company “Service Package” ad, International Confectioner August 1917, p. 14-15. Dr. Naismith quotation, International Confectioner June 1917, 61. Eat More Candy! or not? Happy New Year! If your New Year’s Resolutions include a more nutritious diet, you are probably planning to cut down on candy. Of course, in different times there have been different ideas about nutrition. Early food science in the late nineteenth century introduced the idea of the “calorie” as a measure of the energy content of food, and recognized three major components of the diet: protein, fat, and carbohydrate.Back in the early 1900s, this food science provided an outstanding rationale for eating more candy. It will be seen that candy has a high energy value–higher than meat, fish and vegetables. From a laboratory point of view, half a pound of chocolate creams, supplemented by a small bag of peanuts, contain all the dietetic elements that are essential for a wholesome and nourishing day’s diet. Three meals can be obtained from the chocolates and peanuts, and the body’s needs be met and the appetite satisfied. Sweets are the necessities of childhood and youth, hence Providence has wisely implanted in the young an insatiable desire for sugar. Without this element largely mingled with its food the healthiest born infant would die in a month. In vain would it nestle on its mother’s bosom, in vain its exposure to the warm sunshine, and in vain the softest blankets and warmest furs to encase its body. For the warmth which sustains human life comes from within, and must be generated by the internal combustion of carbonaceous food as found in all sweets and fats. It is the most inveterate of all prejudices in civilized life that sweets hurt children. On the contarary, they are a prime necessity, and to deprive them of those, if made pure, is downright barbarism. Are you eating Candy Enough? The hunger for sweets is natural. The normal man or woman who is not eating a reasonable amount of candy daily is not being properly fed. Recognizing the wholesomeness of the candy DEMAND, we have equipped our store to meet it with a wholesome SUPPLY. For us in the twenty-first century, candy is clearly an indulgence, a treat, a little something extra. But the story of candy in the twentieth century was often dominated by a struggle to persuade or prove otherwise, that candy was wholesome and nutritious food. Is it? Sources: “Pure Candy is Healthful–Sound the Slogan,” Confectioners Journal Oct 1916, p. 86; “Infancy Dependent Upon Sweets,” Confectioners Journal May 1915, p. 68; Viedts advertisement, Confectioners Journal October 1916, p. 83. In the 1950s, vitamins were all the rage. Prior to the work of the chemists, the usual way Americans took their vitamin A was in cod liver oil. But what if instead, people could get their vitamin A from something yummy, say, candy? Everybody needs vitamin A. So it was a potentially lucrative project for the chemical industry to develop a synthetic, stable form of Vitamin A. The prize was enormous: the military and the government were very interested in increasing the nutritive value of foods that could be stored and transported easily. In particular, the U.S. Army was interested in fortifying Army rations including candy, peanut butter, milk powder, and crackers with a palatable, stable form of vitamin A. In 1952, Pfizer developed a technique of gelatin stabilization that minimized the deterioration of the vitamin, and contributed no objectionable taste or odor. They tested chocolate bars fortified with the gelatinized vitamin A and found 92 percent retention after four weeks storage at 45 C (they don’t specify, but these must have been the modified military chocolate, as ordinary chocolate would have gotten pretty melty at this temperature, equivalent to 113 F). How much chocolate was consumed with vitamin A supplementation we don’t know. But we do know that synthetic vitamin A in amounts in excess of the RDA is pretty toxic. It’s usually called “retinol,” and today it is more familiar as a skin treatment than as a food additive. On the other hand, a candy bar that could prevent vitamin A deficiency and treat your acne flare ups might be pretty useful. Source: “Vitamin A Fortification Research,” Candy Industry 12 February 1952.